Former Florida Gov. Jeb Bush made waves around the United States after telling a group of investors that his brother, former President George W. Bush, is one of his closest advisors when it comes to crafting policy related to Israel. The comments were made Tuesday at a Metropolitan Club meeting in New York City, according to the Washington Post, which cited anonymous sources who attended the event. Jeb Bush was asked about who advises him on foreign policy and the potential presidential candidate replied that his brother plays a large role in shaping his position on relations with Israel. “If you want to know who I listen to for advice, it’s him,” Bush said, according to four people quoted by the Post. There were some conflicting reports about how specific Bush was, however, since CNN quoted three other attendees as saying that George W. Bush’s important role didn’t end with Israel. Instead, the news outlet stated that Jeb Bush was actually referring to the Middle East in general, not just Israel. “What you need to know is that who I listen to when I need advice on the Middle East is George W. Bush,” CNN reported Bush saying. Jeb Bush’s spokesman, Tim Miller, denied that the comments were about the Middle East as a whole. “Gov. Bush deeply respects his brother’s service to this country and in response to a question about James Baker and Israel, he reiterated that he looks to his brother whose stalwart support for our ally is in line with his commitment to standing with Israel in the face of great threats to their security and our own,” Miller said in a statement to CNN. 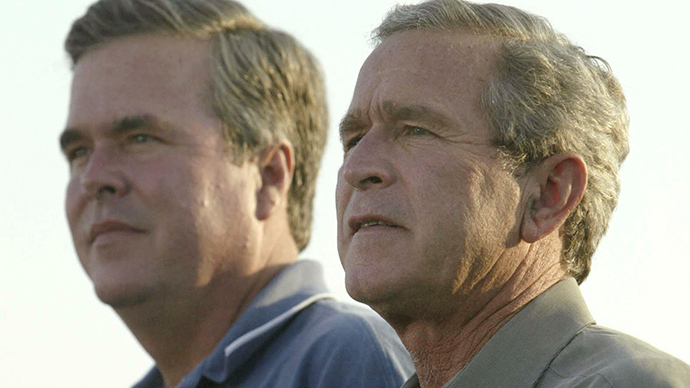 The comments would be significant either way, as any potential presidential run for Jeb Bush will likely involve addressing the fact that his brother remains extremely unpopular, particularly when it comes to the invasion of Iraq in 2003 and Middle Eastern policy in general.